Abstract: Everyday life applications highly depend on successful speech transmission and speech communication, to name a few: smart homes with voice commands, hands-free mobile telephony, and speech recognition with machines. In all these applications it is quite important to guarantee a high performance robust to the background noise or reverberation in the room. A pre-processing stage in the form of signal enhancement is very important in order to remove the undesired background noise sources. Our goal is to develop methods for estimating the desired source signal observed in noise and to tackle new challenges in different speech applications: noise reduction, source separation, robust automatic speech/speaker recognition and artificial bandwidth extension. Paper entitled "Single-Channel Speech Enhancement Using Inter-Component Phase Relations" is accepted to Speech Communication Elsevier journal. For more information we refer to here. Our paper entitled "A pitch-synchronous simultaneous detection-estimation framework for speech enhancement" is accepted to IEEE Transactions on Audio, Speech and Language. Congragulations to Johannes! For more information we refer to here. Our paper entitled "New results in modulation-domain single-channel speech enhancement" is accepted to IEEE Transactions on Audio, Speech and Language. For more information we refer to here. Pejman Mowlaee, project leader of PhaseLab, successfully accomplished his Habilitation qualification at TU Graz and got promoted to Privatdozent (Adjunct Professor) assigned to speech signal processing field of science. Our paper entitled "Iterative Joint MAP Single-Channel Speech Enhancement Given Non-uniform Phase Prior" is accepted to Elsevier Speech Communication Elsevier Journal. For more information we refer to here and audio examples. 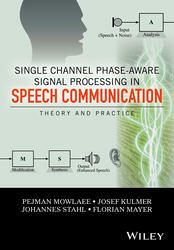 The book entitled "Phase-Aware Signal Processing in Speech Communication: Theory and Practice" is published at Wiley & Sons publisher. The book presents a complete overview on the challenging new topic of phase-aware signal processing. PhaseLab won ISCA grant for INTERSPEECH 2016. Congragulations to Johannes Fahringer [Link]! PhD Position in Signal Processing for Speech Communication: Please send your application (CV, motivation letter, list of grades, and names of references) to Firstname.Lastname@tugraz.at. Applications will be considered on a rolling basis. Special Issue in Elsevier Speech Communication Journal 2016: Together with Dr. Rahim Saeidi and Prof. Yannis Stylianou we proposed the special issue entiteld "Phase-Aware Signal Processing in Speech Communication" to EURASIP Speech Communication. The detailed information about the special issue is available at EURASIP website with further information regarding the important deadlines and aims and scope here. Tutorial Session at INTERSPEECH 2015: Pejman Mowlaee organized the tutorial session "Phase Estimation From Theory to Practice at INTERSPEECH 2015 in Germany. More details are available in the following paper (more details available at INTERSPEECH 2015 webpage here. Special Session at INTERSPEECH 2014: Together with Dr. Rahim Saeidi and Prof. Yannis Stylianou, we organized the special session entitled "on Phase Importance in Speech Processing Applications" at INTERSPEECH 2014 in Singapore. More details are available in the following paper. [Website] The introductory slides for the program and introduction of the special session can be found here. P. Mowlaee, J. Kulmer, J. Stahl, F. Mayer, Phase-Aware Signal Processing in Speech Communication: Theory and Practice, John Wiley & Sons, Dec. 2016 [Website | Toolbox | Demos]. S. Barysenka, V. Vorobiov, P. Mowlaee, Single-Channel Speech Enhancement Using Inter-Component Phase Relations, Speech Communication, vol. 99, pp. 144-160, March, 2018 [Audio][pdf]. J. Stahl, P. Mowlaee, A pitch-synchrnous simultaneous detection-estimation framework for speech enhancement, IEEE Transactions on Audio, Speech and Language Processing, vol. 26, Iss. 2, pp. 436-450, Feb. 2018 [Audio]. P. Mowlaee, M. Blass, W. B. Kleijn, New results in modulation-domain single-channel speech enhancement, IEEE Transactions on Audio, Speech and Language Processing, vol. 25, no. 11, pp. 2125-2137, Nov. 2017 [pdf][Audio]. F. Mayer, D. S. Williamson, P. Mowlaee, D. Wang, Impact of phase estimation on single-channel speech separation based on time-frequency masking, Journal of Acoustical Society of America (JASA), vol. 141, no. 6, June, 2017 [pdf][Audio]. P. Mowlaee, J. Stahl, J. Kulmer, "Iterative Joint Maximum A Posteriori Single-Channel Speech Enhancement Given Non-uniform Phase prior", vol. 86, pp. 85-96, Elsevier Speech Communication Elsevier, Feb., 2017 [Link][Audio]. 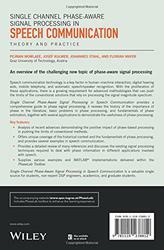 P. Mowlaee, R. Saeidi, Y. Stylianou , "Recent Advances in Phase-Aware Signal Processing in Speech Communication", Elsevier Speech Communication, vol. 81, pp. 1-29, 2016. (DOI: 10.1016/j.specom.2016.04.002) [link][pdf]. P. Mowlaee, J. Kulmer, "Phase Estimation in Single-Channel Speech Enhancement: Limits-Potential", IEEE Transactions on Audio, Speech and Language Processing, vol. 23, Issue 8, pp. 1283-1294, August, 2015. P. Mowlaee, R. Saeidi,"Iterative Closed-Loop Phase-Aware Single-Channel Speech Enhancement", IEEE Signal Processing Letters, vol. 20, no. 12, pp. 1235-1239, December, 2013. [Matlab]. J. Stahl, P. Mowlaee, "Overcoming Covariance Matrix Phase Sensitivity in Single-Channel Speech Enhancement with Correlated Spectral Components" in Proc. 13th ITG Conference on Speech Communication, pp. 286-290, September, 2018 [Paper][Demo]. J. Stahl, P. Mowlaee, "A simple and effective framework for a priori SNR estimation", in Proc. ICASSP, pp. 5644-5648, Calgary, Canada, 2018 [Paper][Demo][Poster]. M. Pirolt, J. Stahl, P. Mowlaee, V. Vorobiov, S. Barysenka, A. Davydov, Phase Estimation in Single-channel Speech Enhancement Using Phase Invariance Constraints, pp. 5585-5589, ICASSP, 2017 [pdf][Demo]. M. Blass, P. Mowlaee, B. Kleijn, Single-Channel Speech Enhancement Using Double Spectrum, in Proc. INTERSPEECH, pp. 1740-1744, September, 2016.2016 [Conference][pdf][Demo]. J. Stahl, P. Mowlaee, Iterative Harmonic Speech Enhancement, in Proc. 12th ITG Conference on Speech Communication, pp.~31-35, October, 2016 [Paper][pdf]. J. Fahringer, T. Schrank, J. Stahl, P. Mowlaee, F. Pernkopf, Phase-aware processing for automatic speech recognition, in Proc. INTERSPEECH, pp. 3374-3378 2016 [Conference]. J. Stahl, P. Mowlaee, J. Kulmer, Phase-processing for Voice Activity Detection: A Statistical Approach, 24th European Signal Processing Conference (EUSIPCO), pp. 1202-1206, 2016. P. Mowlaee, "Phase Estimation From Theory to Practice", Tutorial session at INTERSPEECH 2015, Dresden, Germany, 2015 [Website]. A. Gaich, P. Mowlaee, On Speech Intelligibility Estimation of Phase-Aware Single-Channel Speech Enhancement, in Proc. INTERSPEECH 2015, pp. 2553-2557, Dresden, Germany, September 2015 [PDF][Matlab]. A. Gaich, P. Mowlaee, On Speech Quality Estimation of Phase-Aware Single-Channel Speech Enhancement, in Proc. ICASSP 2015, pp.216-220. Brisbane, Australia, April 2015 [PDF][Matlab]. P. Mowlaee, M. Watanabe, "Iterative Sinusoidal-based Partial Phase Reconstruction in Single-Channel Source Separation", 14th Annual Conference of the International Speech Communication Association, Lyon, France, pp. 832-836, 2013 [PDF][Matlab]. J. Kulmer, P. Mowlaee, M. K. Watanabe, "A probabilistic approach for phase estimation in single-channel speech enhancement using von mises phase priors", IEEE International Workshop on Machine Learning for Signal Processing (MLSP), vol., no., pp.1,6, 21-24 Sept. 2014. P. Mowlaee, R. Saeidi, "Time-Frequency Constraints for Phase Estimation in Single-Channel Speech Enhancement", The International Workshop on Acoustic Signal Enhancement (IWAENC), 2014. C. Chacon, P. Mowlaee, "Least Squares Phase Estimation of Mixed Signals", 15th Annual Conference of the International Speech Communication Association, Singapore, 2014. P. Mowlaee, R. Saeidi, Y. Stylianou,"INTERSPEECH 2014 Special Session on Phase Importance in Speech Processing", 15th Annual Conference of the International Speech Communication Association, Singapore, 2014 [PDF][Slides]. P. Mowlaee, R. Saeidi, M. Watanabe "Show & Tell: Iterative Refinement of Amplitude and Phase in Single-channel Speech Enhancement", INTERSPEECH 2014, pp. 2134-2135, 2014 [PDF][Video]. P. Mowlaee, M. K. Watanabe, and R. Saeidi, "Show and Tell: Phase-Aware Single-Channel Speech Enhancement", 14th Annual Conference of the International Speech Communication Association, Lyon, France, pp. 1872-1874, 2013 [PDF][Video].